I believe I have stumbled upon both a book and an author who is going to send me off reading at tangents for some time to come. Jennifer Potter writes fiction and non-fiction - I want to track down everything she has written. One of Jennifer's previous works was The Rose - a result of five years tracking "the rose's evolution as a flower and as an idea, struck by how central it has been to so many cultures." She concluded that "who you are dictates how you see the rose; and that each age and each society has reinvented the rose in its own image. Through the rose we tell our stories, both personal and collective... if the rose can do this, what about other flowers?" Her new book looks at the lotus, lily, sunflower, opium poppy, rose, tulip and orchid - untangling the botanical and cultural evolution of each one - "Here are the flowers of healing, delirium and death; of purity and passion; of greed,envy and virtue; of hope and consolation; of the beauty that drives men wild." Seven flowers.. is available from the library as an eBook and can be accessed via our EBL Collection. Published in 2013 by Atlantic Books, this title will appeal to lovers of words, flowers and history. And if you enjoy this you may want to read The Language of Flowers by Vanessa Diffenbaugh, reviewed by Natasha on this blog in 2012. 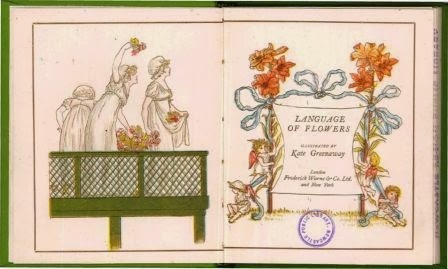 As a special treat you could follow up some of our other titles, including The Language of Flowers, illustrated by Kate Greenaway, published in 1940. It's a little gem from our stack, or "the vaults" as we sometimes say. Being such an old book, it is not for loan but can be viewed by request - just phone 4974 5340, or drop into the Information & Research Centre on the First Floor at Newcastle Library.